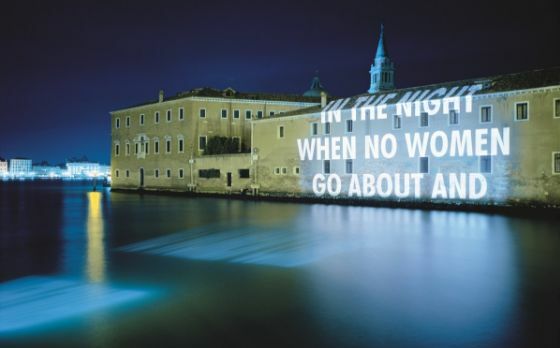 A new body of work by Jenny Holzer is showcased at Blenheim Palace, Woodstock, Oxfordshire from 28 September to 31 December 2017 in an exhibition titled SOFTER. The exhibition brings together a series of works by Holzer focusing on the history of conflict; the theme was influenced by Holzer’s initial visits to the Palace, which has an extensive military history. SOFTER will transform the historic façade of Blenheim Palace with a series of new light projections by the artist. The projections will be shown during free evening events for 12 nights between 28 September and 10 October. Book your tickets for the free evening projections here. The new light projections are part of the exhibition’s broader insight into Holzer’s work, which regularly engages with public space through interventions into its architecture, furniture and semiotics. The majority of works presented in SOFTER are new pieces; they include examples of the artist’s engraved stonework and LED displays. The exhibition also includes a new installation using black mondo grass, and a bespoke mobile app developed specifically for the exhibition. With the app, visitors can create new splicings of digital and physical space by adding digital layers to the physical surroundings of the palace.